Ahoy to you all again! 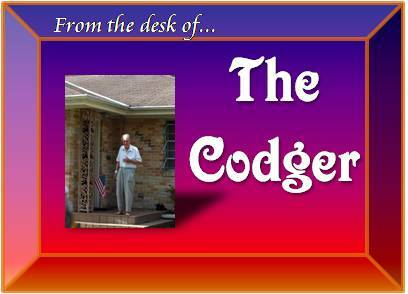 Welcome back to my little “lifestyle column”: From the desk of The Codger. I’m just about to do my patrol around the block. The neighborhood Block Watch committee has long been known for being rife with corruption, so I’ve decided to take matters into my own hands and keep an eye on things myself. I’ve got 9-1-1 on speed dial on my cellular phone, so if I notice any suspicious activity, I’ll be able to phone it in right away. This weekend I’m taking Max, Tricia, and Fiona camping in my new pop up trailer. Since Tricia’s friends Derek (the one that was in the Army), Jessica (Derek’s pregnant girlfriend), and C. J. (the artist) are now using the trailer as their primary residence for the time being, I decided to invite them along as well. I thought, why not? It’ll be like a big party. They were thrilled when I asked them. Simply thrilled. They’re such bright young people, and I’m glad that I can be a positive influence on them. What crowns of thorns are holding back your creativity? Sometimes we cannot always live up to the “gold standard”, but that doesn’t mean we should not make an attempt. Take a few moments to step out into an open field and clear your mind. You deserve it.